You’ll never be caught with a dead battery when you have this pack as a spare! Keep going through your busy day without any worry about your devices running dry. 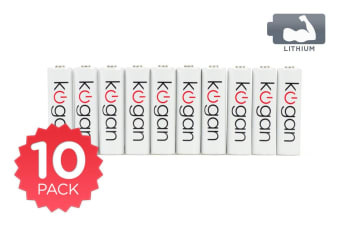 With the 10 Pack Kogan Lithium AA Batteries not only can you take advantage of their massive 2700mAh capacity, you can have spares to keep around the house or office too. Plus, Lithium batteries weigh far less than standard alkaline ones and also have the capacity to hold on to power for longer when lying idle.